Prime is already well established as a facilities company with considerable experience in managing a wide range of services within all aspects of production. Our full production services are aimed at companies who wish to focus all of their resources and talents on the more creative aspects of programme making as well as foreign News organizations who would like story ideas sent for consideration and perhaps lack the local contacts and knowledge needed to arrange all of the services they require for a planned event or production. Prime are happy to consider co-productions as well as supplying broadcasters or production companies wishing to "smart-source" many of the day to day arrangements and logistics associated with programme making. We serve all areas of media production including broadcast and video content for new media productions, commercials and corporate videos. We offer a full creative package from programme content ideas to advice on location sourcing, and full production facilities to fully compliant programme delivery. 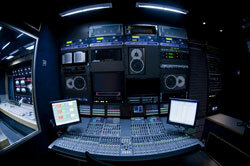 Prime offers leading end to end broadcast facilities and media expertise.